Today, everything about the way we work has changed. Your employees, customers, and extended ecosystem have greater expectations than ever before, and the voice and unified communication solution you select is one of the most important decisions you can make toward a collaborative, connected, and productive workforce. 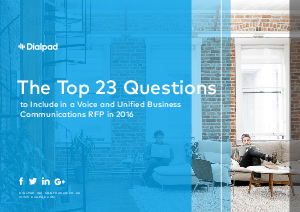 This list gives you some of the most important questions to include in an RFP this year, as well as key insights about how these will play out for your business.